Introducing the new Jones Complete Bicycle. Check out this video where Jeff talks about and rides this new bike to learn more. This is a complete Jones bicycle that is pre-assembled, in a box, available in three sizes, and ready to ship within the contiguous US, subject to availability. Orders usually ship out from our warehouse within 48 hours. A great bike for dirt, road, mountains, gravel, city, touring/trekking, bikepacking, commuting, fitness, riding around the world or just around your neighborhood. Big 27.5” x 3" Plus Maxxis Chronicle tires mounted to 50mm wide rims allow you to run very low pressure for better traction, flotation, comfort, lower rolling resistance, less flats and more safety, on dirt or road. The frame has three water bottle mounting locations, two of which can accommodate triple-boss style. The fork can hold two more bottles for a total of five on the bike. Painted black with semi-matte clear coat applied over the decals. 150x15mm Thru-Axle hub with Sealed Cartridge Bearings. Canted flanges angle the spokes in toward the spoke holes in the rim, and the wide and even flange spacing makes for an extremely strong and stiff wheel. Cutaways in the flanges and relief inside the hub keep weight to a minimum, making this the perfect center for a super stiff, super strong wheel. 32 hole 148x12mm Boost hub with Sealed Cartridge Bearings. Black, Shimano Driver. Like the front hub, this is a simple, durable hub. Shining DB-X50 50mm wide double wall anodized black 6061-T6 Aluminum. This is a very high-quality rim that shares features with many name brand ones. Bead lock bump keeps the tire on the rim even at low pressures. Tubeless ready. Maxxis Chronicle 27.5 x 3", 60 TPI. All around good tire with a great balance of low rolling resistance and traction, making it a great choice for the widest range of conditions. Jones SG Aluminum Loop H-Bar. 710mm, Black. The straight gauge version of our most popular H-Bars. Tektro MD-M300 with one-piece aluminum body, Automatic Caliper Centering (A.C.C), inside pad adjustment with a very positive indent. Barrel adjuster for cable tension and outside pad adjustment. Automatic pad angle adjustment via floating plates. Tektro MT 2.1. with adjustable cable position so you can change the leverage, feel and power of the brakes. The pinch bolt is underneath the lever body so the top is smooth for comfortable riding when your hands on the lever clamp. Forged aluminum lever for durability. Jagwire KEB-SL Elite Ultra-Slick; These highly polished stainless steel cables offer the ultimate in low-friction, smooth performance. Jagwire KEB-SL, Pro Compressionless brake housing - linear strand, Kevlar® reinforced, compressionless brake housing with Slick-Lube liner. This is the same great housing we use on all of our bikes that come with mechanical brakes because it gives an extremely smooth and solid feel at the lever with more stopping power. Aluminum Boost Crankset with 24mm chromoly spindle, 104BCD, 165mm arms on small and 170mm on medium and large sizes. 32t Machined narrow-wide teeth keep the chain on. Steel, tough and long lasting. Sunrace CSMS2; 11-42t, 10 speed, Long lasting steel sprockets with stiff steel spiders and ED black coating. 10 speed Shimano Deore RD-M6000-GS Shadow RD+ low profile design with clutch to keep the chain tighter and in place and with less chain slap. Shimano Deore SL-M6000, 10 Speed. Functionally almost identical to its higher-end siblings, this shifter is precise and reliable. Jagwire LEX-SL, 5mm, This is Jagwire's best standard shift cable housing. Linear strands of steel are used to encircle the Slick-Lube Liner creating a compressionless ring. This delivers responsive, precise shifting. 5mm housing is more durable and has more room for the inner wire to slide smoothly even if contaminated with dirt, compared to standard 4mm shift housing. Velo, Black with black steel rails. • Small- Rider height 5' - 5'8", Standover at center of top tube is 29". • Medium- Rider height 5'7" - 6'2", Standover at center of top tube is 30.5". • Large- Rider height 6' - 6'6", Standover at center of top tube is 32". All sizes of the Jones Plus SWB have a 69° head tube angle, and a 72° effective seat tube angle. The chainstays are 17.68"/449mm from bb to axle center. The Jones Plus SWB is designed mainly to be used with either 27.5 x 3" or 29 x 2.3-2.6" tires. It has lots of clearance with these tires. If you live in a place where clearance isn't much of an issue (a dry environment, for instance), and want to run something larger, in the rear, we have found that smaller 29x2.8 with reasonable clearance. A 27.5”x3.8” fat front wheel will fit and is a great option. Check out this SWB bike with a 27.5" x 3.8" fat tire up front and a big 27.5" x 3.25" tire in the rear. An SWB bike with 27.5x 2.8" tires for for the road. Jones Plus Complete Bicycle manual. Options that are out of stock will show a "notify me" box where you can put your email address to be notified when they are available. To see the breakdown of the differences between the older Jones 29 and the newer Jones Plus SWB, check out the chart here! This is a complete, assembled and boxed bike. We recommend having it built, tuned and maintained by a qualified bicycle mechanic. Shipping has been going for around $150-175 on the West Coast and $200-250 to the East Coast, by FedEx with insurance and signature required at delivery. We currently offer FedEx or UPS shipping. We tend to prefer FedEx because it usually ends up being less expensive, but both are reliable and fast. Bikeflights.com is another shipping option that has been recommended by a few of our customers for low cost bike shipping, but their service does not currently integrate with our ordering system. If you choose this option you will be responsible for creating the shipping order with Bike Flights and getting the shipping label for the bike box to us. Please check into www.bikeflights.com and if you would like to ship this way don’t place your order on this page, please contact us by email or phone and let us know what size bike, and any extra parts you would like to order and we will give you the bike box dimensions and other information you will need. We have included a few of the most common additional parts you might want with your new bike as options to be ordered with the complete bike. This allows you to order them without throwing the shipping quote off. 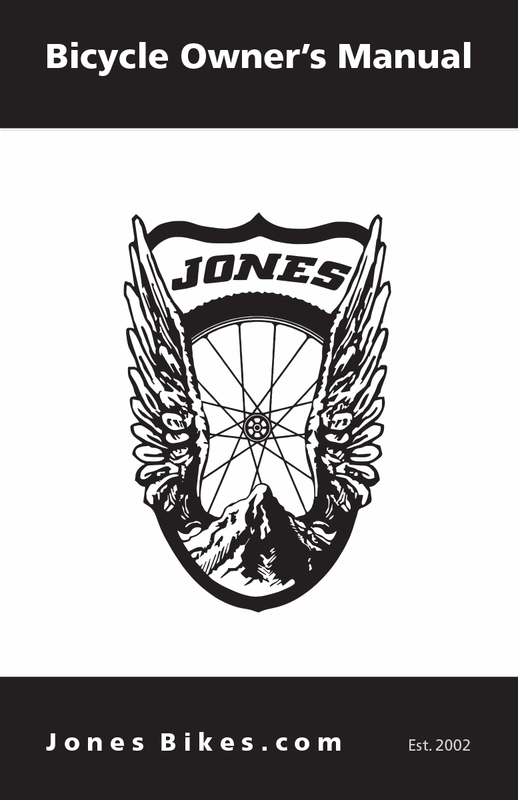 If you have questions or if you would like to add any extras that are not shown on this page, please contact us by phone at (541) 535-2034 or email us at contact@jonesbikes.com.